I love a face mask but, I have to admit, I often dispair at the messy, time-consuming process of applying and removing it. 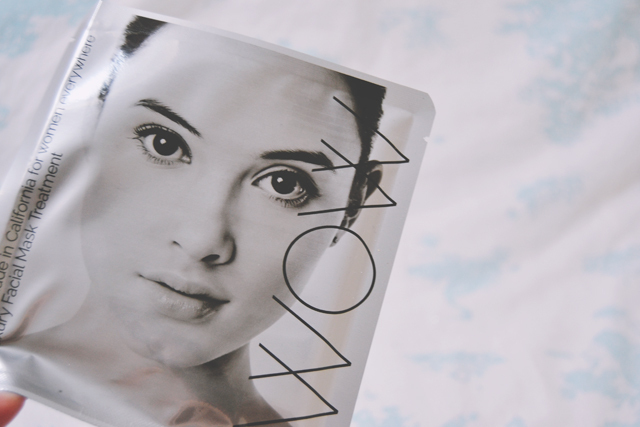 Needless to say, I was very intrigued by the concept of the Hyalual WOW Mask*, an aqua gel mask that promises to reduce the appearance of fine lines and pores and revitalise skin. 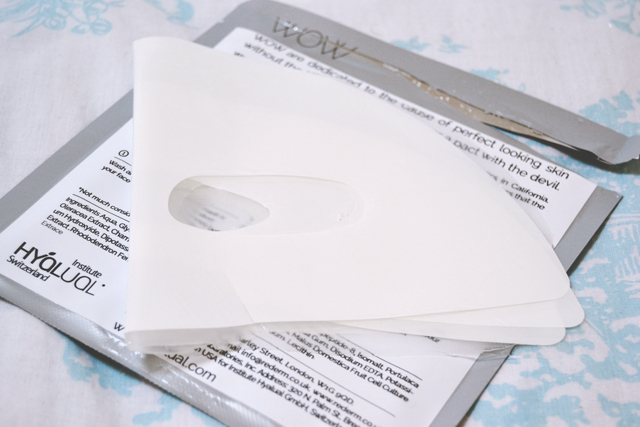 The mask is wrapped in a foil packet, which keeps it moist and saturated in the gel. 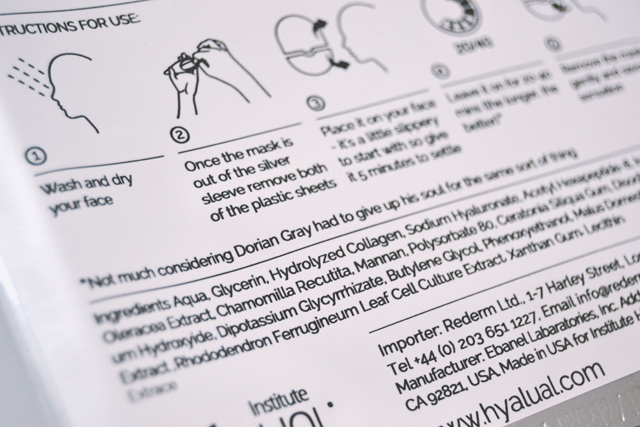 Although the packet explains that the mask uses "the essence of some of nature's most effective, skin-loving plants", it doesn't state what these plants are, which is a shame. Examining the ingredients list (and Googling the Latin names), it seems that they include rhododendron and apple, but it would have been nice to see this made more clear. However, I do like the touch of humour on the packaging. It's always nice to discover a brand that uses a personable, humorous approach in their branding. As I removed the mask, the strong scent became immediately apparent. Although it initially seemed to be a chemical-based fragrance, over time it developed more into a floral-fruit aroma. Applying the mask was much simpler than I thought. It's packaged in two halves, with holes for the mouth and eyes. I just needed to unpeel the mask from the backing paper, like I would with a plaster, and smooth it onto my face. Although it was very slippery to the touch, it was easy to apply and not at all fiddly. Once it was applied, there was a cool, soothing quality to the mask and, to my surprise, it quickly became an almost matte consistency, meaning I could move around without it falling off my face. At first it was an unusual sensation, and I felt like a little like Damian putting ham on his face in Mean Girls, but I soon got used to it. It's recommended to leave the mask on for 20-40 minutes, the longer the better, so I kept it on for the maximum of 40 minutes. By this point, I was starting to get impatient, not least because I wasn't wearing my contacts at the time and was unable to put my glasses on while wearing the mask. 40 minutes with no vision is a long time! Peeling the mask off was a lot of fun, I have to admit! You remember how much fun it was the peel PVA glue off your hands at school? It was just as satisfying as that! Contrary to the expected slimy face, I found that it was actually dry straight away. Although it felt smooth, I wasn't especially blown away by the sensation. However, it certainly looked a lot younger and the fine lines that are starting to wiggle their way onto my forehead were barely visible. I enjoyed using WOW Mask a lot. 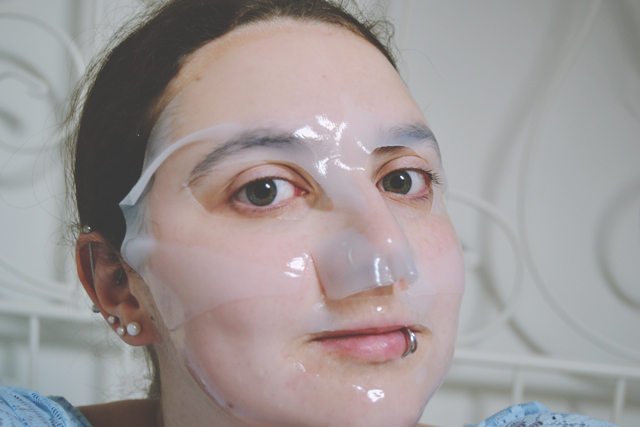 It was a fun novelty to apply a gel mask, and certainly made for no-fuss application, but the inconvenience of not being able to wear my glasses for an extended period of time wasn't ultimately worth the results. I'd use it again, but it wouldn't be my first choice. Wow, it sounds strange but lovely all at once! I also love when brands add a dash of humour/personality in their packaging. i love sheet masks. even though its a pain to wear them for 45 minutes, its definitely worth it for me. which reminds me, i need my nightly pamper session. LOL.